Author Notes: This is adapted from a Food Network “Home Moravian Church” 2003 recipe. It is quick and delicious and a favorite of my own sweet Justin. If in a rush, you can omit orange juice and cornstarch. I find that I almost always double the glaze recipe so we have plenty for leftovers. In a small cup, stir together the orange juice and cornstarch until there are no lumps. In saucepan, over medium heat, combine cranberry sauce, orange juice mixture, five spice, salt and pepper. Bring to a boil to allow cornstarch to thicken sauce, stirring. Remove from heat. Line a roasting pan with heavy-duty foil. Lay, intact, sliced onions across entire foiled pan so onions create a solid bed. Place pork tenderloin on top of onion bed. Heavily pepper and lightly salt the meat. Cook in oven for 10 minutes. Spoon about ½ cranberry sauce over tenderloin. Reduce heat to 350 degrees and cook for additional 30 minutes or until meat reaches internal temperature of 170 degrees. Remove pork from oven. Transfer pork to carving board and tent with foil. Pour pork juices from roasting pan into cranberry saucepan. Put onion-lined pan back in oven at 250 degrees for about 10 minutes. Bring cranberry sauce with meat juices up to a boil over medium high heat. Stir to combine and reduce heat to low. 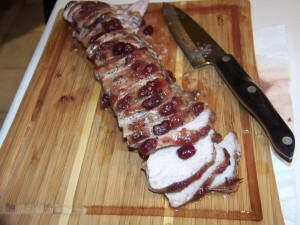 Slice pork and serve with cranberry sauce and roasted onion slices.